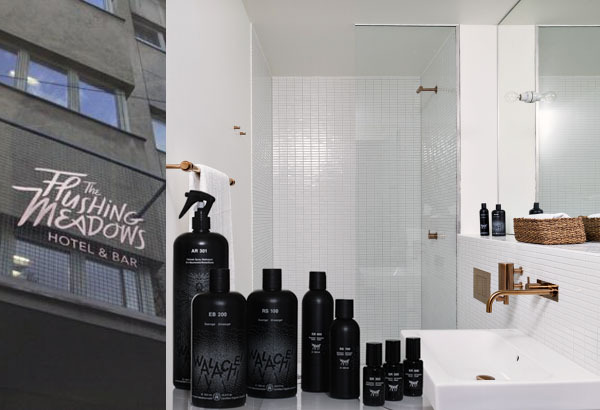 Munich’s latest Design Hotel member: The Flushing Meadows, dreamt of a signatory scent matching the idea of a perfect stay in their hometown. FUNDAMENTAL SCHOOL developed and realised the concept of a signatory scent made of 100% natural essential oils. The result: a refreshing wild alpine meadow scent crossed with vibrant urban excitement. The natural signatory scent is applied in vegan refresh textile sprays and handsoaps used in public spaces of The Flushing Meadows Hotel. The goal was to establish production based on vegan energy sources. There is hardly any energy supplier who is not working with by-products from livestock. Instead, vegan energy not only offers green energy, but at the same time energy without factory farming and intensive agriculture. Vegan electricity comes exclusively from hydropower plants and wind turbines. Conventional shoe care and textile care products are based on mineral oil and synthetic scents with no transparency on applied energy sources. The complete lack of transparency in applied energy sources of common products indicates that cheap fossil or nuclear based energy sources are used. It’s like with all other ingredients as well: only if you research, analyse and deliberately use environmentally certified electricity, one is sure that it is such. To be fair, one has to say that, for example, in Germany, a high proportion of renewable energy is produced, but that does not mean that it is used locally. It is traded through power line networks in the global energy trade, and is traded on the like shares. In reality, there is lack of transparency on which energy source we use and where it is generated. We selected a production facility powered with vegan hydro power from Norway. Wind and hydro energy are vegan energy sources. Solar and biogas based energy are not considered vegan, as animal produce is applied in the energy generation process or in equipment.